Investors dumped currencies in emerging markets, underscoring growing anxiety about the ability of developing nations to prop up their economies as they face uneven growth. The emerging-market slide reflects worries about outside forces—such as a shift in U.S. monetary policy, or China’s efforts to reorient its economy—colliding with domestic political and economic tensions, unsettling investors at home and abroad. Turkey, for instance, has been rocked by a deepening political crisis tied to corruption allegations. South Africa’s leadership has been under increasing fire for its failure to pull citizens out of poverty over the past two decades. Argentina’s struggle to right its course since its 2002 currency crisis has sent inflation soaring and weakened its international credibility further. Technical analysis (TA) is the study of charts. TA often gets slumped together with voodoo and palm reading. The power of charts, and why they are used by the vast majority of pension funds, is they allow us to monitor the mechanism that sets asset prices. Our market model tracks the market’s pricing mechanism and allocates portfolios based on the observable evidence. The CCM Correlation Model is scaled between 0 and 100. We can think of 100 as sunny skies or favorable investor weather. A reading of 0 means we need to seek shelter/wear a coat. The model’s reading at the close Wednesday was a still comfortable 77. If the temperature outside dropped from 77 to 50 in a matter of hours, logically, we would alter our clothing choices. Similarly, when the market’s tolerance for risk begins to drop sharply, it is logical to reduce exposure to growth-oriented assets, such as stocks, and increase exposure to more conservative assets, such as bonds. That is exactly what we did before the close Thursday; we reduced our allocation to stocks, and added Treasuries (TLT) to the mix. One example of an observable shift in investor sentiment can be seen in the stock (SPY) vs. bond (AGG) chart below. 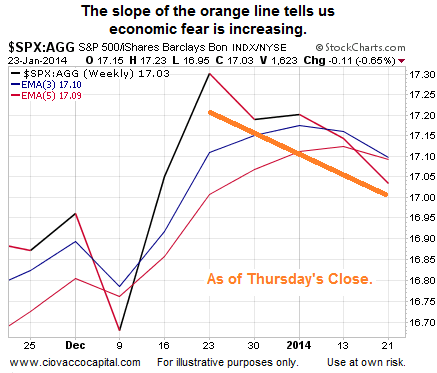 The fundamental concepts behind the chart were covered in Thursday’s article. The worst selloff in emerging-market currencies in five years is beginning to reveal the extent of the fallout from the Federal Reserve’s tapering of monetary stimulus, compounded by growing political and financial instability. Investors are losing confidence in some of the biggest developing nations, extending the currency-market rout triggered last year when the Fed first signaled it would scale back stimulus. While Brazil, Russia, India, China and South Africa were the engines of global growth following the financial crisis in 2008, emerging markets now pose a threat to world financial stability.